STOCKHOLM, SWEDEN (May 19, 2011) Bindomatic AB, an innovative, international company dedicated to providing top quality business solutions for professional document finishing, has announced today that it will expand its technological document glue product offering to commercial print industries P4P service suppliers. The patented Bindomatic FlexiCut Glue product will allow commercial printers and graphic arts companies the ability to use the FlexiCut glue with their own covers or books that they manufacture or create. The Bindomatic book binding adhesive used in the FlexiCut glue sheets is developed in close cooperation with raw material supplier to meet the expectations of the commercial printing industry, and results in an extremely strong perfect bind style binding. With the new Bindomatic FlexiCut glue, a commercial printer can print customized covers in-house and as a final step bind the documents using Bindomatic patented binding technology. The FlexiCut is ideal for short to medium runs and specialty binding - all at a fraction of the cost and process time compared to traditional perfect bind systems. 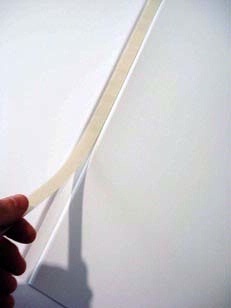 The FlexiCut glue sheets include a book binding cloth that ensures top flex strength. Working in close cooperation with global printer manufacturing companies, printing experts have expressed their surprise regarding the Bindomatic book binding strength compared to traditional book binding methods. The glue sheets are cut down by operator to glue strips with same width as the documents to be bound. Strips are positioned inside the printed, scored and folded cover – once the printed document sheets are inserted the Bindomatic binder automatically takes care of the rest. “We are pleased to offer our exceptional FlexiCut technology to suppliers in these industries, providing a solution of strong and lasting products and customer relationships.” says Jörgen Friman, CEO & President of Bindomatic AB. Bindomatic AB, a Swedish corporation doing business on a global scale through a vast distributor network and with wholly owned subsidiaries on five markets. The U.S. headquarter is located in Wilmington, NC under the trademark Coverbind Corporation. Since many years, Bindomatic has been providing patented covers and binding machines to customers throughout the world with a commitment to continue developing product enhancements that allow consistent delivery of the highest quality professional binding solutions to customers.